What Athletes and Sports Parents Want! Play Smarter. Compete Better. Have Fun. My new book, The Young Athlete's Guide to Playing Sports: What Every Athlete Needs to Know to Play, Win, and Have Fun is now available on Amazon. 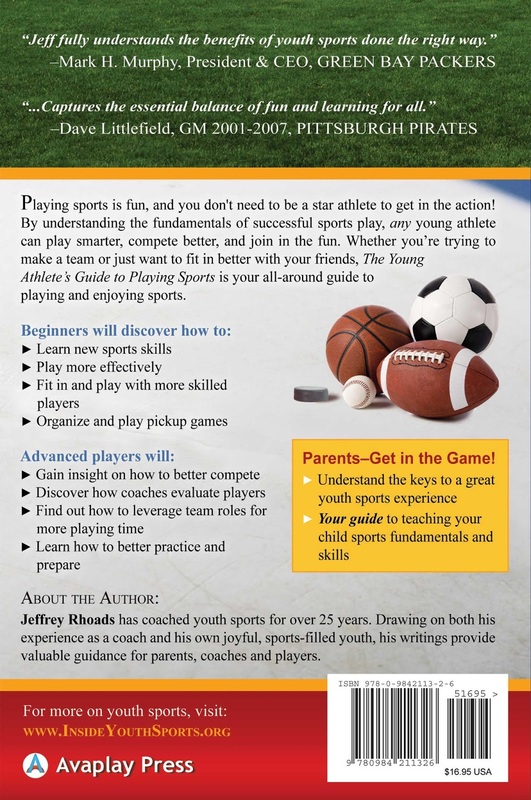 The Young Athlete’s Guide to Playing Sports includes inside tips, techniques and approaches that will help any player, in any sport, improve his or her game. How can you move and react quicker? How can you compensate for your physical limitations? In any sport, what tactics help you gain advantage? What behavior causes other players to not want to play with you? What key qualities do coaches look for in their players? Besides offering dozens of practical tips on how to improve your play, this book will also help you better understand your relationship with sports. You will discover how to balance competition and fun, select the right sports, find your unique path to success, and prepare yourself for a lifetime of enjoying sports. This book is also a valuable guide for parents. Not only does this book help parents understand the keys to a great youth sports experience, but it also provides them with a tool for teaching their young child sports fundamentals. Parents can paraphrase the book’s tips and techniques and incorporate this information into their personal instruction. Likewise, parent coaches will find the instructional advice helpful. A chapter titled “What a Coach Wants” will help beginning coaches better understand how to evaluate a young player and use team roles to help each player succeed. The Young Athlete's Guide to Playing Sports Presents a Positive Approach to Competing and Winning. If you're affiliated with an organization that is interested in distributing this book to your member community, substantial discounts are available. Please contact info@insideyouthsports.org for more information.